In case of emergency, your family or coworkers can leave a message during class hours by calling the Boston facility at 617-262-4201 or SAS Customer Service at 800-727-0025. In case of inclement weather, please call ahead for information on delayed openings or cancellations. You are responsible for your own transportation to and from the training facility. View directions in Google Maps. Parking is available at the Prudential Center garage and also at Cheri Cinema at Dalton Street. MBTA buses, commuter trains, and the Green and Orange subway lines are all within a five-minute walk from Prudential Center. For information on public transportation to the Prudential Center area, please call the MBTA at 617-722-3200. 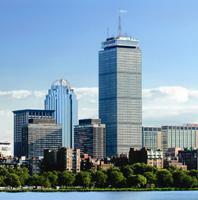 Our office is located on the 22nd floor of the Prudential Tower, which is inside the Prudential Center. Take the free shuttle bus to the T (subway train) station. Take Blue Line train inbound to the Government Center station. Go one level up to the Green Line. Take the E Green Line train to the Prudential Center stop. Take the escalator or stairs up into the Prudential Center. It's very important to get on the E Green Line train. The Green Line splits into 4 routes (B, C, D, and E) at the Copley Station and the E is the only one that visits the Prudential Station. This will take approximately 35 minutes from the airport to the Prudential Center.